The Alaska Earthquake Information Center located a moderate earthquake that occurred on Tuesday, January 9th at 6:49 AM AKST (15:49 UTC) in Canada near the border with southeastern Alaska (red star). 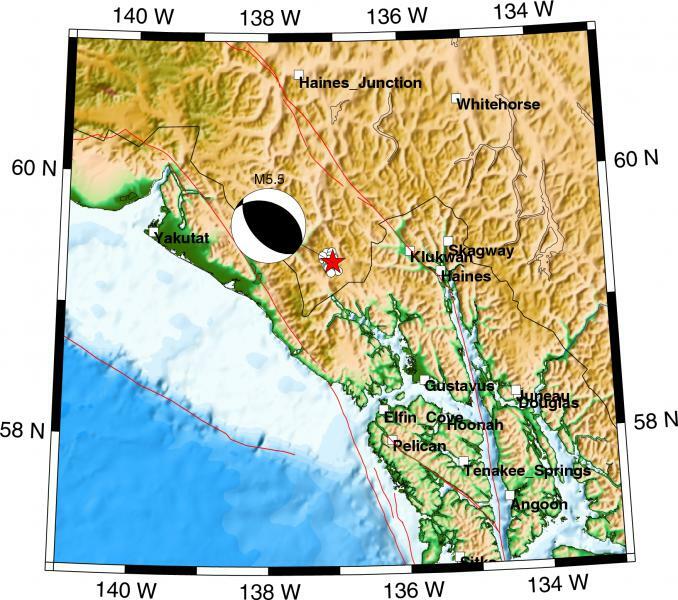 This earthquake had a magnitude of 5.7 and was located at a depth of about 6 km. It was located 91 km (57 miles) W of Haines and 99 km (62 miles) W of Skagway. The Earthquake Center located a total of 37 aftershocks in the first two days after the mainshock, with magnitudes ranging from 1.5 to 3.2 (white circles). This event was felt in many southeastern Alaska communities from Yakutat to Petersburg and in Canada as far as Whitehorse. Maximum intensity of shaking was reported in Gustavus (V, moderate) (See Internet Intensity Map). This event was located in an area between the two main strike-slip fault systems in the region, the Denali fault in the east and the Fairweather fault in the west (red lines). The Fairweather fault system marks the transverse boundary between the North American plate to the east and the Pacific plate to the west. The Denali fault is an intraplate structure that traverses Alaska and Canada for about 1,200 km. This event was located in the region directly affected by the ongoing collision of the Yakutat block with North America. This collision causes buildup of tectonic stress in the earth crust that is released in events similar to the M5.7 earthquake of January 9, 2007. The source parameters of the M5.7 earthquake indicate reverse faulting on a NW-SE oriented fault plane.